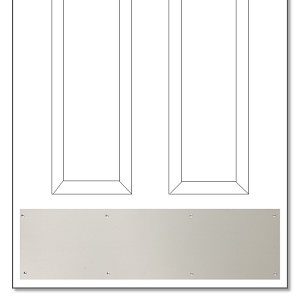 Satin Stainless Steel Kick Plates are available in 6" x 8" heights and several widths. You can also choose from screw mount, magnetic mount and adhesive mount. Please double check the width you order to make sure you get the right kick plate. Generally you will want to order a kickplate that is 2" shorter than your door width so that it doesn't get in the way of your door trim and weatherstripping. So if you have a 36" door for example, you'll want to order a 34" wide kickplate. Many kickplates are custom made to order in the finish you need. Some standard sizes are in stock, but please allow 2-3 weeks before shipment. Screw mounted satin stainless steel kick plates are easy to install. Check out our kickplate installation page for more information. I had been looking for a brushed nickel kickplate that had an adhesive back and no holes pre-drilled in it forever and finally found one on your site. I received it very quickly and installed myself. Quick service, superior quality. Working out fine so far. Didn't think the self sticking plate would stay on the door but it has. Kick plate is great looking, well manufactured and was easy to install. installation only took a few minutes via supplied screws and it provides a great layer of protection to the doors lower finish. kick plate arrived quickly and was packaged in a cardbord container and was well protected. Product is good - but expensive. 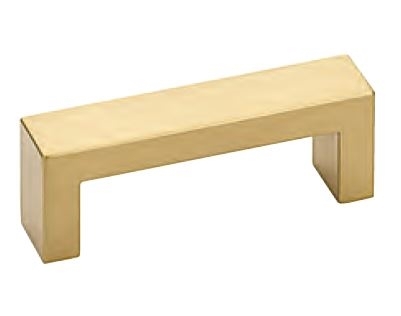 This product says Quality through and through. Packaged weel too. High quality hardware, came promptly in perfect condition. 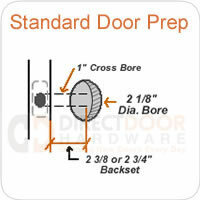 Ordered this magnetic kickplate for our steel patio door and it fits great. Helps protect the paint when the dogs scratch at the back door to come inside. Got one for the other side stationary door. Kickplates clean up easily with stainless steel cleaner. Great product! We placed this kickplate on the newly painted island where the bar stools come in contact with it. Looks and works GREAT! Will save an expensive paint job!! Everything about it was as I expected. Arrived in perfect condition. Can I get a 6 x 34 satin stainless lick plate without any form of mounting. I will drill the holes using the old kick plate as a template ?